In Spain, appetizers are taken very seriously. 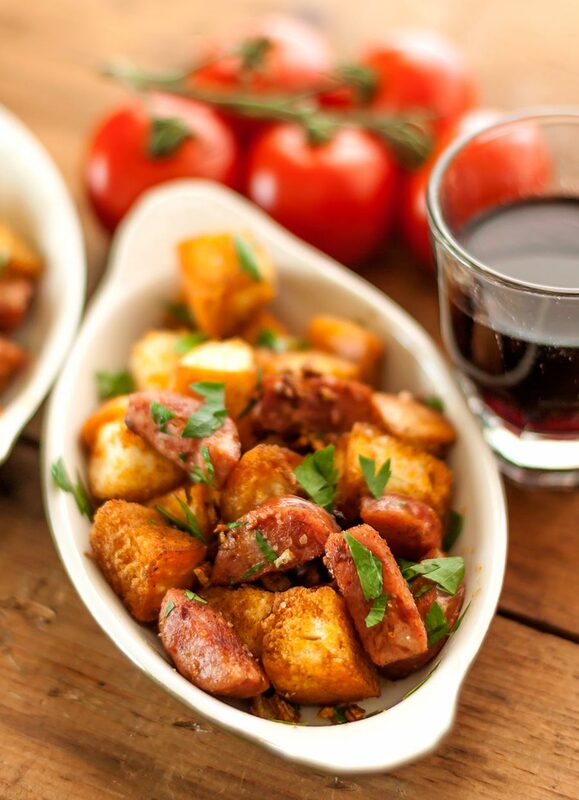 Spanish tapas, the ubiquitous small plates found in every taverna and dining place, are numerous and varied. 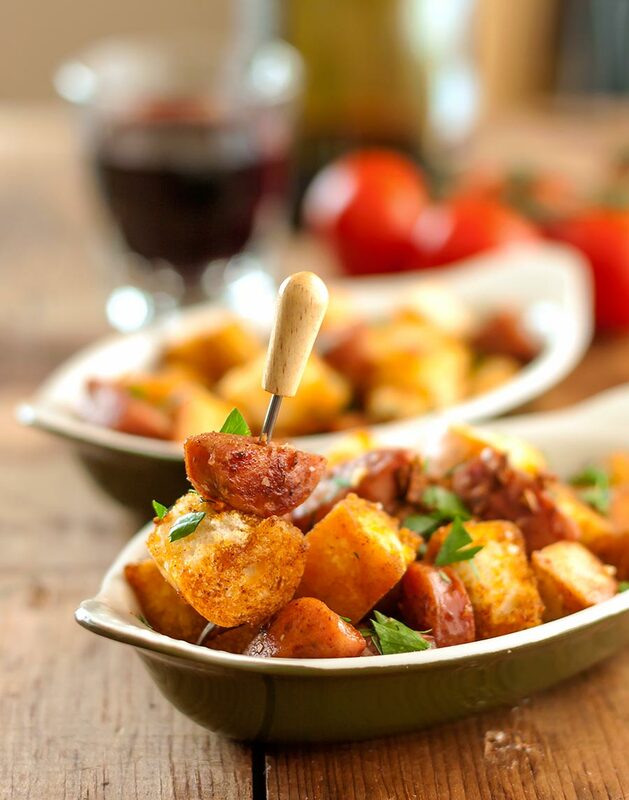 With literally hundreds of variations, Spanish tapas are colorful and robustly flavored, full of the bright and bold tastes of the sun-drenched countryside. 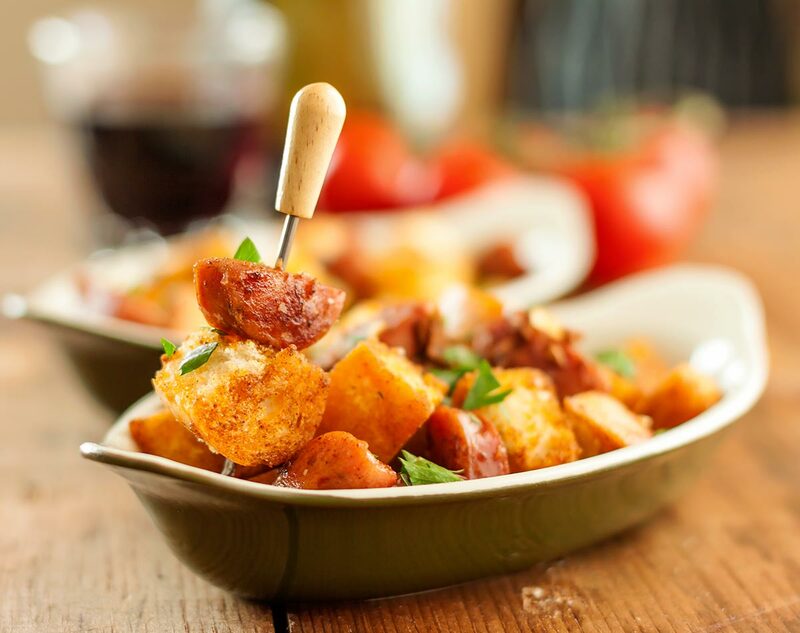 Like most Spanish tapas recipes, Pan-Fried Bread & Sausage with Garlic uses just a handful of ingredients, each with a bold flavor that stands on its own, yet harmonizes perfectly with the others. This simple, rustic approach to appetizers guarantees a dish that’s both easy to make and easy to like. It takes only minutes to prepare, but is certain to keep your family and friends coming back for more. Whip up a batch for your next dinner party or barbecue and watch it disappear! This dish would most usually be made with Spanish chorizo, the highly spiced, cured salami-like sausage that is completely different from the Mexican sausage of the same name. Instead of chorizo, we opted to use a meaty Andouille sausage from Smoking Goose Meatery of Indianapolis, Indiana. Located in the heart of Midwestern hog country, Smoking Goose uses select cuts from a small group of farms who are dedicated to producing the finest pork possible. This attention to detail shows in every product they make; we’ve enjoyed everything that we’ve tried and can recommend all of their products without reservation. Slice the sausage into 1/2 inch thick pieces. If the sausage is large, cut each round into two half-circles. Cut the bread, crust and all, into 1/2 inch cubes. Add enough olive oil to a large, heavy-bottom skillet to completely cover the bottom. Don’t be tempted to skimp – start with 3 or 4 tablespoons and be prepared to add more. Heat the oil to medium-high and add the garlic. Cook, stirring constantly until lightly browned, about 1 minute. Don’t burn the garlic or it will become bitter. Add the sausage and cook, stirring, until browned, about 2 – 3 minutes. Sprinkle the paprika and cayenne, if using, over the top and stir it in well. Add the bread cubes and fry, stirring continuously, until crisp and golden brown. Splash on more olive oil if the pan is too dry. Transfer to a serving bowl, season with the sea salt, and toss together with the chopped parsley. Serve immediately.